May 2015 – Oh Man, Oman, Man! It’s hard to understand how different Omani culture is from that in the United States. Everyone knows that women in Oman must dress modestly, but modesty is required of men as well! We were told that we cannot wear shorts outside of our room, and I’ve heard that I will need to wear long sleeves during Ramadan, so I guess I’ll need to buy some clothes! There are also a lot of rules: for example, we cannot leave our compound aside from planned excursions. Some rules are unclear because everything has been in Arabic! I can’t complain about anything though. I’m the foreigner here, and I’ll go with whatever they want for us. 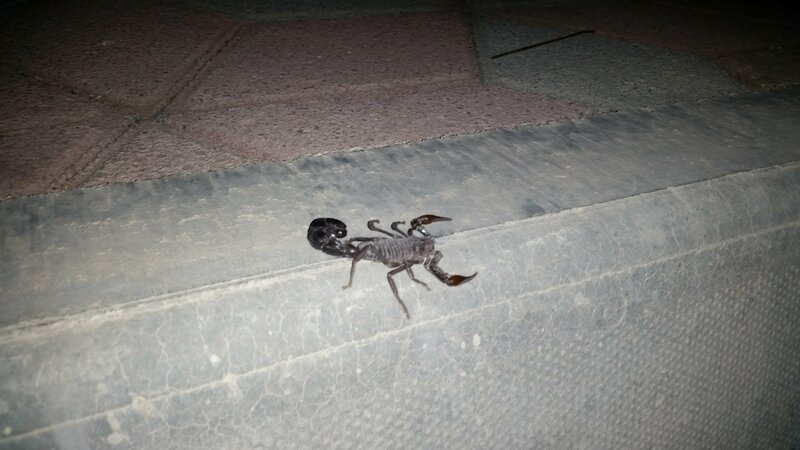 I didn’t start the day of so well… There are a lot of bugs in Oman, and most of you know how I feel about that. Wasps are constantly trying to fly into our bathroom, so of course as soon as I got in to take a shower in the morning one flew in, and I flew out when I saw it. We took care of it though. This will wind up being a good thing I think; it will help me conquer my fear of bugs. In sha’ Allah (god willing). The view of the mountains from our complex. The main Guest House building. Sultan Qaboos as we enter the building for our room. 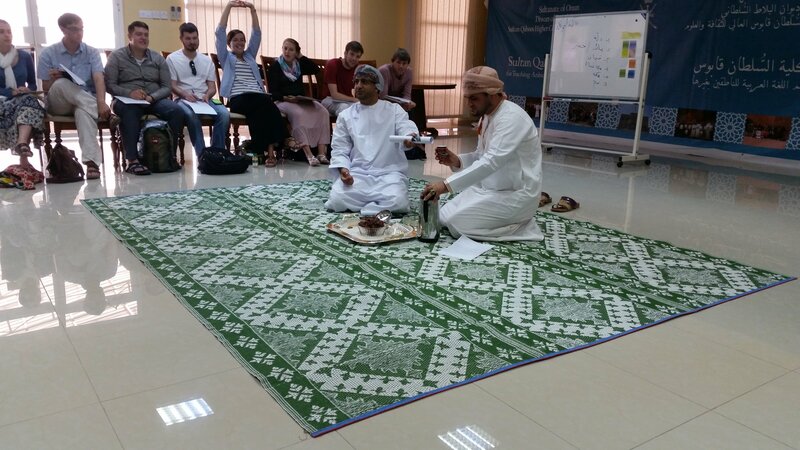 After that, we took a bus to the actual Sultan Qaboos College for Teaching Arabic to Non-Native Speakers. Yeah, that’s a long name, so I’m just going to call it the College from now on. We met all of the workers there. I’m already bad with names, so I’m even worse at Arabic names. We took a tour of the school, and after that we had about two hours of lectures on various rules and Omani culture (all in Arabic). One interesting cultural rule is that those of the opposite gender do not shake hands when they meet. Then we took a two hour placement test. It was very difficult, but I don’t really mind since I won’t have any fun if I’m not in an appropriate level. We all have different skill levels, so it’s a very good idea to have us split up into classes with equal levels so that people don’t get upset and everyone has equal opportunities to speak. More of Sultan Qaboos. In Arabic, it says “God Save the Sultan”. After we went back home, we had a break in the afternoon and then went to visit Manah in the evening. We had a very cool tour. 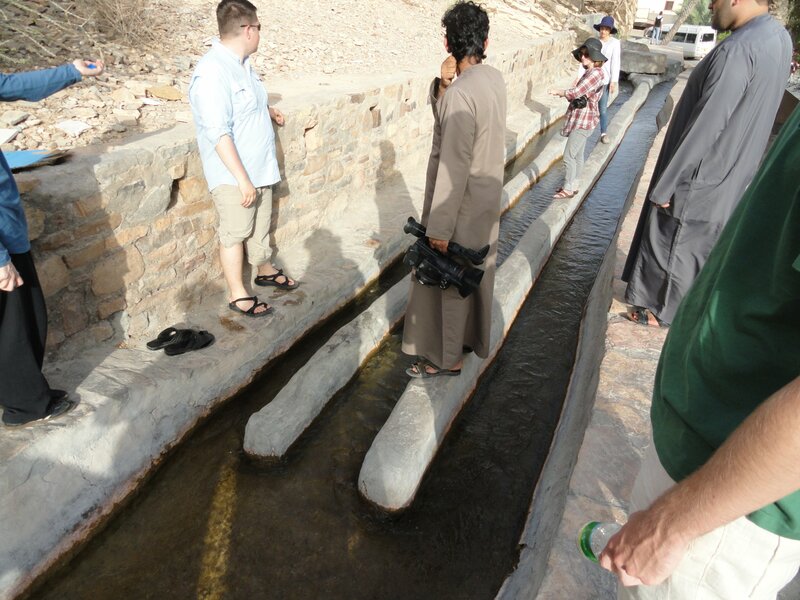 We started with a falaj, which is an Omani underground irrigation system. It’s really a pathway underground for water to flow through. I think the source for this one was about 25 kilometers away. We went to some ruins of a village in Manah around a fort, and then we went to the ruins of another city that are currently being restored. They are not open yet, but we were allowed in! I believe the village we saw then was over 600 years old. 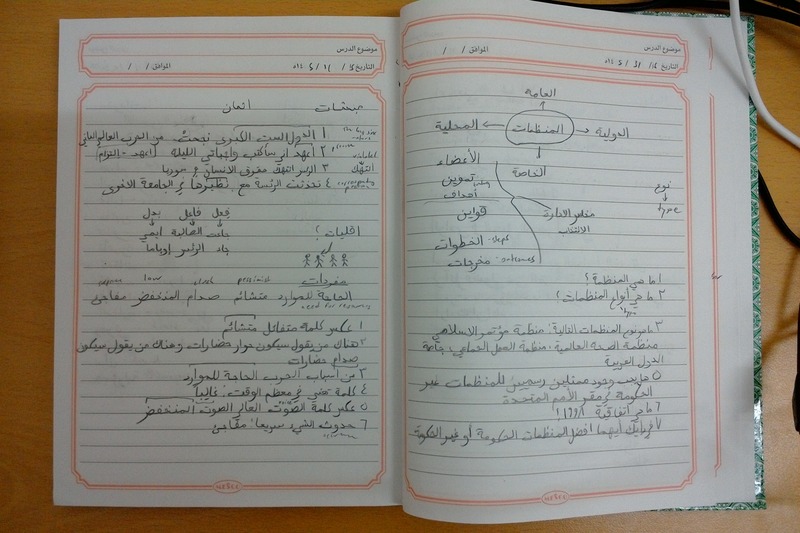 Not all of my facts may be accurate because all of the explanations are in Arabic! Our guides, wearing traditional Omani clothing. A date palm. These are everywhere. You can see the clusters of dates! Another view of the fort in Manah. One of the rooms in the first old village we visited. Opening the door just for us! I thought the sun behind the clouds was pretty. Our guide, Khalil in a mosque in the second old village we visited in Manah. It was a fun day, but I’m very tired now. Today was my first full day in Oman. I’ll start with a few random interesting things in case you don’t want to read all of this. Oman is pretty, but also incredibly hot! Not that I didn’t expect that. 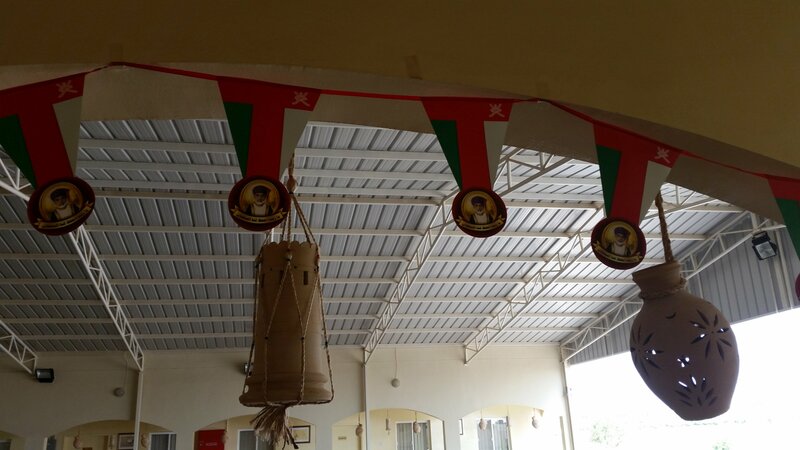 Pictures of Sultan Qaboos are everywhere! On billboards, in every office space, in our dorm, everywhere. The buildings, even modern ones, though, look very different. They’re mostly light colors and built to be more heat-efficient in this weather. There’s a ton of empty space here as well. And by empty I mean nothing other than rocks and some bushes. Some people in my group have said that it’s a lot like Arizona. Even Muscat, which has 1 million people, only had mostly smaller buildings than one would expect and was very spread out. Most people here speak some English, and almost every sign is in English and Arabic. Speaking Arabic has helped, though, and people here are always impressed to see Americans speaking it. I’ll start with last night since I haven’t written since then. We arrived at Muscat around 10:00 PM. Even at 10:00 at night, it was about 90 degrees outside, and it was humid! And I saw my first mosque in Oman in the airport parking lot. After we met our guide, Tilal, and a few others from the Sultan Qaboos College for Teaching Arabic, we went to a hotel in Muscat. I thought we were going to drive straight to Manah, but staying the night in Muscat turned out to better. Tilal wound up taking us out to a restaurant called “Old Turkey Restaurant”, and I had some Tabouli, Hummus, and Baba Ghanoush. Tilal wants us to speak only in Arabic, which is cool but difficult. All of our travel directions and instructions are now in Arabic (of course he will speak English with us if we really need). Luckily, everyone in the college is very comfortable speaking Fusha, or Modern Standard Arabic. I’ll now go off on a tangent about Arabic in case anyone isn’t familiar with the difference between Modern Standard Arabic and colloquial Arabic, so if you are already familiar or not interested you can skip the next paragraph. The current state of the Arabic language reminds me a little bit of Latin in the early days of the development of Romance languages. There are several dialects of Arabic, some of which are mutually intelligible, and some of which aren’t. Two of the main groups, for example, are the Levantine and Egyptian dialects. Then there is the Fusha (“foos-ha”), or Modern Standard Arabic, which is derived from classical Qur’anic Arabic. 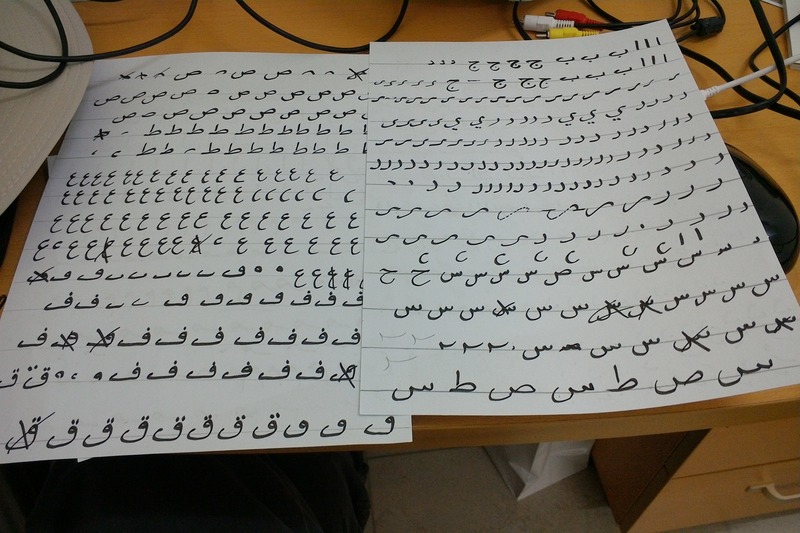 No Arab speaks Fusha in their everyday lives, but everyone understands it because it is used in most media, and Arabic is traditionally only written in Fusha. So it’s a little bit of an awkward situation with the language. People don’t really just speak Arabic, they speak their own variety of it, and some are about as different as French and Spanish! But people in the Middle East want to preserve the idea of Arabic being a single language because of its religious connotation. We learn Fusha in most schools in America because all educated Arabs understand it and because it’s easier to sell I think because one can claim more speakers. Anyways, it’s nice that Tilal and our guides at the college are willing to speak Fusha with us because most of my Arab friends seem to prefer English. I essentially passed out after I finished my food because I was so tired. Fortunately, though, I have almost no jet lag! I’m eight hours ahead here, by the way. Today we drove from Muscat to Manah, which was about a two hour drive. We drove through the Jebel Shams mountain range, which was very pretty but strange. The mountains are almost all rock; I’m used to seeing green mountains. We arrived at our dorm complex in the afternoon. Our complex is on the outskirts (far out of walking distance because of the heat) of Manah, which is an incredibly small town on the outskirts of Nizwa, which is a slightly larger city. We’re far away in our own little enclave. The dorms are nice, though. Unfortunately there is not a piano or guitar in sight. We went to a grocery store called Lu Lu but for some reason we only stayed about thirty minutes (even though the drive there was thirty minutes). The living area for the college. The bathroom – a single room with a shower and a toilet. Very efficient! I’ll be taking a few Arabic placement tests tomorrow! I just touched down in Doha, Qatar. I’ll be here for a couple hours before we take our final flight to Muscat, Oman, where we will immediately drive for about an hour and a half to Manah. 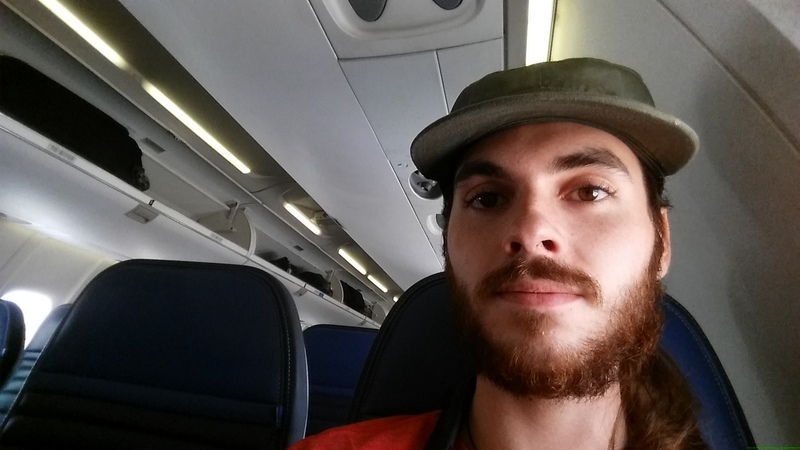 The flight was about what one would expect for a 12 hour flight (it wound up being one hour less). There was a crying baby, but it didn’t cry the entire time, and I managed to get a good bit of sleep in. I’m also very glad that I got Majora’s Mask 3D for my 3DS. I took some pictures of a few things that I thought everyone would find interesting. Strange water in a pudding cup. I had water like this in Turkey, too. Flying over a fun area. “Allahu Akbar” (“God is the greatest”) randomly written in the airport in Doha. A very strange giant bear in the Doha airport. I found a gorilla in the airport! Today I landed in Washington D. C. at about 4:00. I had no idea how huge Dulles is! I had to take a tram just to get to baggage claim. I managed to make it to the hotel by about 6:00. The room is nice, and I even get free breakfast tomorrow. I met with three other students in the SALAM program for dinner, Matthew, Delilah, and Michelle. They are all cool; I’m looking forward to hanging out with them for the next six weeks. Tomorrow, I need to check out of the room by 12:00 and go to orientation at 1:00 (I don’t really know what that entails). I’m not sure what will happen until the evening, but at 9:00 I’ll board the 13-hour flight to Doha, Qatar. Speaking of which, I think that Thirteen-Hour Flight would be a really good band name.